Bornemann SLH twin screw pumps are self-priming, positive displacement pumps. The SLH Series is the best solution for universal or aseptic processes and applications with high viscosities, high pressures, or sensitive media. The SLH pump operates at a wide range of speeds, providing flexibility for many different operating conditions. Therefore, different operating pressures, viscosities, and temperatures are handled at the best operating point. The pump's design provides complete axial balancing of the rotating elements and eliminates all metal-to-metal contact within the pump. SLH can handle virtually any non-homogeneous fluid, regardless of viscosity, lubricity, or abrasiveness. ITT Bornemann makes high-quality, cost-effective pumps and systems that provide outstanding benefits to customers. A superior command of technology has made Bornemann a worldwide leader in its field. The SLH Series from ITT Bornemann can easily be adapted to the user's requirements according to the viscosity, temperatures, working pressures, speed, and other criteria. Speeds range from 100 rpm up to 3.600 rpm. 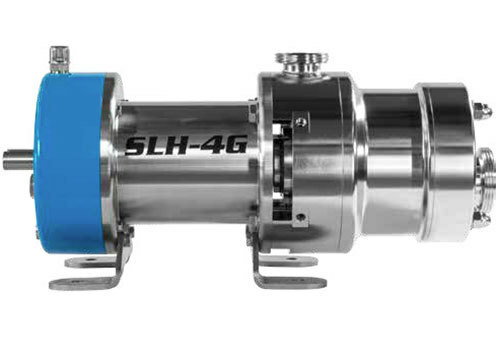 With this range, it is possible to operate the SLH not only on normal process sequences, but also cleaning and clean-in-place (CIP) operations as well, using only one pump. Bornemann SLH twin screw pumps are single-flow and self-priming. The ongoing development of the SLH is based on Bornemann's experience working with customers, general market requirements, and the demands of relevant directives and certifications. The pump housing and two contact-free intermeshing screws form closed chambers that, according to the direction of rotation, constantly move towards the pressure discharge end of the pump. The pumped fluid flows through the screws in an axial direction. The pump imparts very low shear and little pulsation to viscous and shear-sensitive products. The entrance geometry of the suction chamber is modified to accommodate the particular fluid properties of the product, thus allowing the pump to handle applications with liquid, lumpy, and abrasive fluids. SLH pumps are well suited for fluids with high or low viscosity, with lubricating or non-lubricating properties, and fluids containing some solids. Literature for SLH Series Pumps have been saved to your dashboard! Literature for SLH Series Pumps are already in your dashboard.